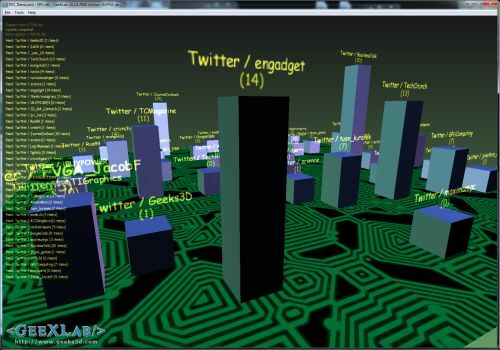 I started yesterday a small project with GeeXLab about Twitter. Actually I wanted to code a RSS reader for regular websites and I finished by coding a RSS reader for Twitter. Each Twitter account has a RRS feed, which is an easy way to retrieve the status of an account. 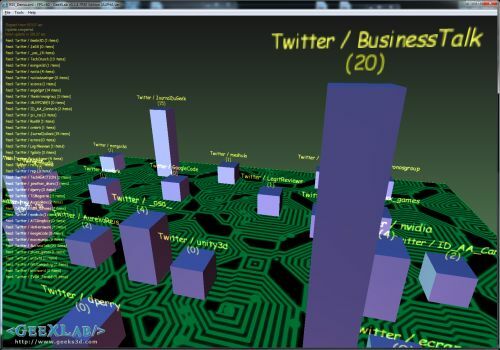 In this very first version, each Twitter user is represented by a building and the height of the building is related to the freshness of the tweets, I mean the number of tweets in the last 10 hours (this duration can be changed!). The maximum of tweets per user is 20 (this is a limitation of Twitter RSS feeds). 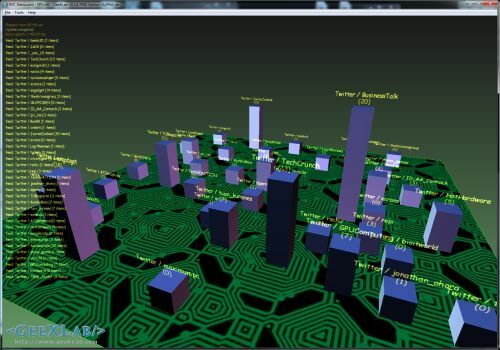 This 3D visualization of the Twitter users allows a quick overview of the most active accounts you follow. In the screenshots, 39 Twitter users are represented. Currently, there is no much work on the graphics side: no texture on the buildings, simple lighting, no post fx, … I’ll try to add cool effects later. I will detail later how things work. I chose the Python language for all scripts and I must say that it’s a good choice: Python really rocks! I’m a newbie in Python programming and this kind of project will allow me to improve my skills with this very cool and powerful language. Complete source code and binaries will be released at the end of the project.